In a medium bowl mix eggs with 2 tablespoons vegetable oil. Add the contents of the Matzo ball packet and stir with a fork until blended. Place in the refrigerator and chill for 15 minutes. Meanwhile, add 1 tablespoon vegetable oil to a large pot and saute the diced carrots, celery, onion and garlic for about 5 minutes. Add water to the vegetables in the pot along with the pepper and a couple of dill sprigs. Cover and bring to a boil. Reduce heat to low, add the Soup mix packet and stir until dissolved. Let simmer for 15 minutes. Remove the chilled matzo mixture from the refrigerator. With wet hands, form the mixture into balls about 1 inch in diameter. With a slotted spoon, place the matzo balls into the soup. Cover and bring mixture to a boil. Reduce heat to low and simmer for 25 minutes. 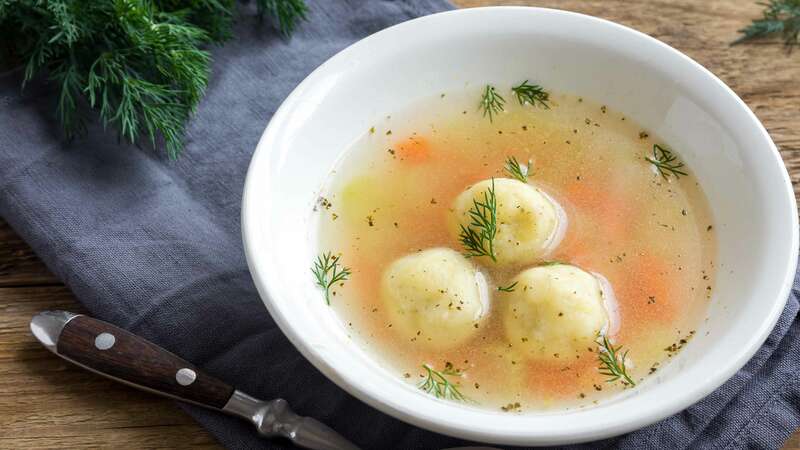 Divide soup into 3 bowls, 3 matzo balls per bowl and garnish with fresh dill if desired.